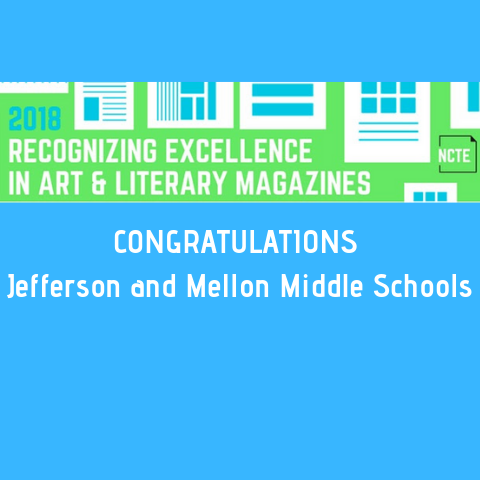 Congratulations to the students and faculty advisors of the Mellon and Jefferson literary magazines, The Outlook and Our Piece of Mind, on being awarded the Recognizing Excellence in Art and Literary Magazines (REALM) Award by the National Council of Teachers of English. The REALM program publicly recognizes excellent literary magazines produced by students with the support of their teachers. REALM is designed to encourage all schools to develop literary magazines that celebrate the art and craft of writing. Both magazines were selected to receive a rank of Excellent in the 2018 NCTE REALM Program. Student Editors: Sylvia Alpern, Josie Cosentino, Anna Mares, Natalie McGee, Layla Obeid, Gia Routh, Molly Schwertfuehrer, Ruby Siefken.